Oi!s top selling and award-winning range of childrens books have now branched out with this exciting activity toy! Oi! Magnetic Phonics helps children to learn about phonics and sounds as they match phonics with pictures and words. Using the 60 magnetic pieces, children will develop their literacy skills as they complete the activities suggested on the back of the pack. Oi Frog, Oi Dog and more have been hugely popular with children and teachers as the books, a publishing sales phenomenon aimed at ages 3-5, combine hilarious rhymes and gorgeous pictures. Oi! 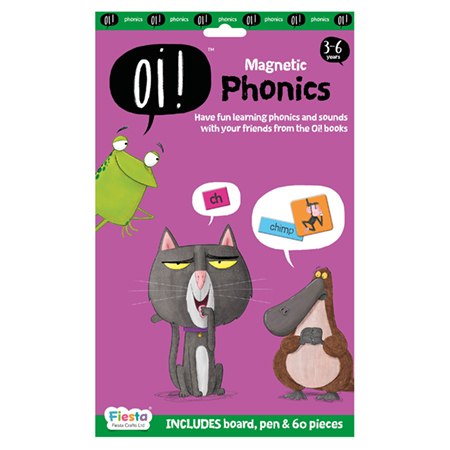 Magnetic Phonics is suitable for ages 3-6 and contains a board and pen as well as 20 magnetic picture pieces, and 40 magnetic phonic and word pieces.